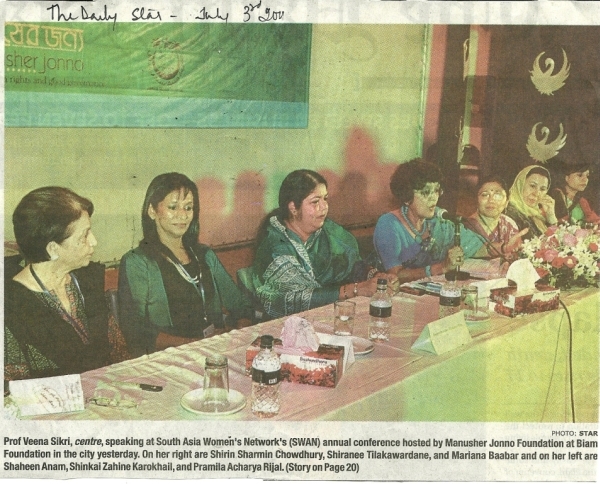 The South Asia Women’s Network (SWAN), which is headquartered in the Academy of Third World Studies of Jamia Millia Islamia University in New Delhi, emerged from the Conference on “Women of South Asia: Partners in Development” in 2009 through establishing eight South Asia Women’s Networks (SWANs). Through these networks members of SWAN share experiences, learn from each other, identify best practices and work towards issue-based collaboration across Asia through agreed plans of actions. The eight SWANs cover the sectors of Micro-credit, Education, Arts and Literature, Women in Peacemaking, Environment, Health, Crafts and Textiles; and Media and Women. SWAN is convened by Professor Veena Sikri. This year the South Asia Foundation, Manusher Jonno Foundation and Jamia Millia Islamia University jointly organized the 3rd annual conference of SWAN at the BIAM Foundation in Dhaka from the 2nd to the 3rd of July. 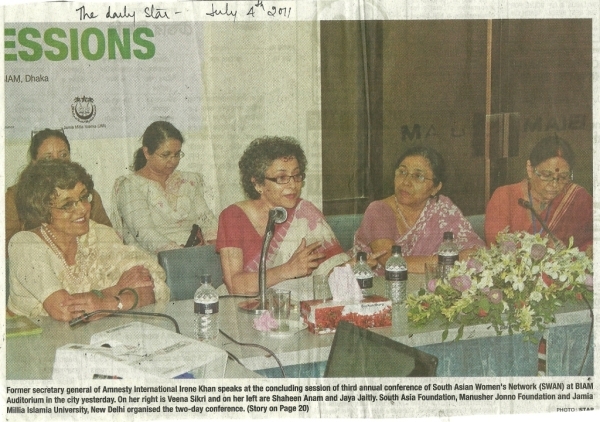 The theme of the conference was Women of South Asia and the Green Economy. 71 members from the 9 participating countries, namely Afghanistan, Bangladesh, Bhutan, India, Maldives, Myanmar, Nepal, Pakistan and Sri Lanka attended the conference. The list of the participants is given in Annexure 1. The chief guest at the conference was Dr. Shirin Sharmin Chowdhury, Honourable State Minister, Ministry of Women and Children Affairs, Government of Bangladesh. Alongside the conference a Crafts Fair was organized at the premises where the countries, participating in 3 SWAN, displayed their local products. The Crafts Fair was inaugurated by Dr. Shirin Sharmin Chowdhury on the morning of the 2nd of July before the commencement of the conference. Before the inaugural ceremony a dance performance of the Raibeshi form, which is both a form of dance and combat, was presented. The welcome address was made by Ms. Shaheen Anam, the executive director of Manusher Jonno Foundation. In her inaugural speech Ms. Shaheen Anam talked about how women toady have shown that there is nothing they cannot do if given the opportunity and how they are marching ahead in all professions including politics. Ms. Shaheen Anam cited Bangladesh as an example where many high positions are held and public offices are run by women. She mentioned that despite these achievements there is another story of killings, trafficking, bride burning and poverty and there are countless women who live their lives in utter misery. She recognized pulling all women out of this situation as one of the challenges of all the members of SWAN. For that, she mentioned, the need of greater solidarity among the members, the need for the members to mentor and assist one another, the need of forging more partnerships and more networks and the necessity of coming up with innovative solutions. Ms. Anam also emphasizes how it is not possible to prosper in this globalized world while one’s neighbours languish in poverty and that every one needed to think beyond borders. Some concrete ways for the SWAN members to stay linked, proposed by Ms. Anam, were to use technology, spend a few hours every month to share good ideas, learn from best practices and most importantly care enough to give more of themselves to each other. She ended her inaugural speech by thanking everybody for being present and by acknowledging the proud privilege of Manusher Jonno Foundation of hosting the event. The convener of SWAN, Professor Veena Sikri, Ford Foundation Chair, Academy of Third World Studies of the Jamia Millia Islamia University, introduced the conference saying that this year SWAN has come of age. She talked about why SWAN was conceptualized; she said that throughout 37 years as a career diplomat, she found that most of the interactions between countries, particularly in South Asia, remained at esoteric levels. Diplomats rarely mingle with the peoples of each other’s countries, they never really understood each other’s sorrows and never shared each other’s joys. Diplomacy remained a government to government concept and was never a people to people concept. This is what SWAN was formed to achieve. : a platform where the women of Souh Asia can bond and develop confidence and trust in each other through shared activities aimed at seeking common solutions to the similar socio-economic problems we share. 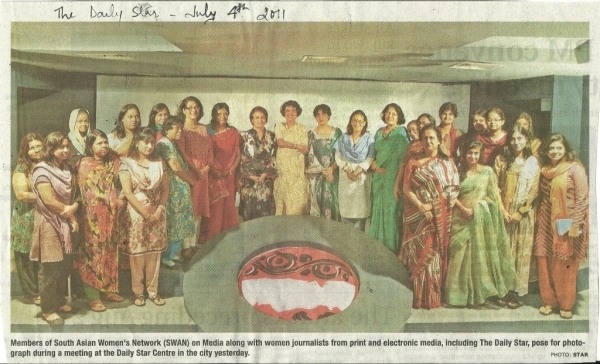 SWAN brings the women of South Asia together in friendship, understanding and in harmony. Professor Sikri says that the inequality faced by South Asian women is holding them back and there cannot be any poverty alleviation in South Asia without women having greater access to resources. In each South Asian family the woman plays a central role, she is the centrifugal force of the family; she takes care of the children, she takes care of the family, she works but very little of all this is considered for inclusion in the calculation of the GDP. Professor Sikri pointed out that in terms. of accessing resources, including access to education, access to health services and equal job opportunities, women in South Asia are facing great barriers. The Global Gender Gap Report (prepared each year by the World Economic Forum), which measures the gap between genders by measuring the difference in the extent of access to resources by the genders, indicates a very poor position for most countries in South Asia. Thus, SWAN was created to bring women together sector wise by establishing 8 different SWANs. She said that women are the anchor of the family and they should now be allowed to be the anchor of society; unless women get just remuneration for what they are doing they will not be able to move forward. 5 problems faced by women, how SWAN could participate in solving them and what projects could be created which would bring the issues of the environment to the forefront. In her address, the Honourable Justice of the Supreme Court of Sri Lanka, Shiranee Tilakawardane, further talked about the oppressions, biased behaviour and inequality faced by women in society through a few anecdotal examples. She pointed out that the problem was when resources were scarce the vulnerability of the women increased manifolds and this was not because of differences in physical strengths of men and women, thus, helping the former to access greater amounts of resources , but, because the distribution of power between the two genders in society was unequal. She was of the opinion that for equality to be achieved it was necessary for organizations to be equally representative and power needed to be shared on an equal basis. Diplomatic Editor, The News, Pakistan, where she acknowledged the privilege of Pakistan to have had the opportunity of making the vote of thanks. She talked about how SWAN on Women in Media could use the recent developments in social networking, through technology, to their advantage. She said how support for women in neighbouring countries could be conveyed via technology by citing the example of millions of people who showed their support, via technology such as social networking sites, online forums etc., for the women of Saudi Arabia who were fighting for their right to drive. act had an effect on many people in Pakistan, those who were interested in what went on inAfghanistan.Talking about militancy and terrorism, Ms. Baabar said that it was very necessary for thecountries in the region to be together to fight terrorism in the region because it was not possible for one country to do it on their own as these people were well armed and well funded with an established network. She concluded by saying that it was not necessary for people to give up on the traditional forms of communication such as newspapers and television, but that technology was definitely much more effective. The first plenary session began with Dr. Vandana Shiva’s key-note address on “Women of South Asia and the Green Economy”. Dr. Shiva began with thanking the organizers and said she loved, “the opportunity to think together and work together.” She stated that she believed that fromthis region of South Asia, it would be possible to defend Earth. She said that while there were some serious outcomes from the 1992 Rio Earth Summit, including the legally binding climate treaty and the convention of biological diversity, the ecological situation has deteriorated over the past 20 years since the summit. She pointed towards the increasing frequency and intensity of natural disasters, including cyclones, floods and droughts. b) has a fear of diversity, because diversity means freedom. She declared that a system that seeks to control cannot tolerate that freedom. She warns that there is an increasing drive by corporations to install a system that would privatize biodiversity. Corporations that used to draw profit from oil are now joining other corporations that work with agriculture and biodiversity to converge into – what they term as – the 17 trillion dollar green economy. She sums up their objectives as: 1. Every life-form should be branded, owned; 2. 75% of biomass that women will make: The economies of energy, fuel, fodder, housing; this should be commoditized. Among these converging companies and industries are BP, Shell, Exxon Mobil, Chemical companies like BASF, Dupont, Monsanto and numerous agribusiness giants, who wish to create monocultures to replace diversity. This will generate biomass for a fossil fuel based economy, which will lead us back to the primary source of climate change. subsidies the various governments give. She brings our focus to USA giving subsidies to convert corn and soya into fuel for cars. According to Dr Shiva, 75% of world food price rise is due to this reason. 15% of corn for bio-fuel is currently replacing 1% demand for fossil fuel in US. Using all the corn will replace only 7% of US fossil fuel demands which is why, these corporations, through the US government, will have to put pressure on other countries and chop down rainforests in Indonesia, take over lands of Africa and cut down the Amazon to grow soya. This system of total control will annihilate life. She refers to this as an Earth Grab, pointing out similarities between this situation and the conduct of the East India Company in the subcontinent during the colonial years. While the East India Company mostly dealt in spices and textiles, they didn’t touch the rest of the economy, because they couldn’t. But today, with changing technology and property rights, the situation has altered and a greater pressure can be put on water, land, seed and biodiversity, leaving nothing for the poor to have. She mentions the fight against what is referred to as bio-piracy, the patenting of traditional knowledge and biodiversity, mentioning the cases of Neem, Basmati and the ancient wheat variety. Monsanto currently controls 95% of genetically engineered wheat planted anywhere in the world and is daily acquiring or controlling local seeds. Dr Shiva refers to the incident with BT Cotton, introduced in India by Monsanto. It has a toxic gene that fights a pest called bollworm. But the bollworm has become resistant, seed costs have increased by 8000%, seeds have become non-renewable and have to be bought. The resistance of the pest and emergence of new pests resulted in 13-fold increase in pesticide use whereas it was primarily supposed to reduce pesticide use. This increased expenditure in pesticide when it came to cotton farming, led the farmers into debt and caused farmer suicides in India. There have been 250000 farmer suicides in the last decade. There is now an attempt for a Pakistan-India agreement to take Monsanto seeds via the government of India to Pakistan. She emphasized the urgency of SWAN-led campaigns for organic cotton and open pollinated seeds so that an alternative path can be established. 10 She elaborated further into another example: the $33million grant for the golden rice movement in Bangladesh by the Gates Foundation. While Bangladesh has plenty of greens to provide iodine and Vitamin A, golden rice attempts to provide Vitamin A as well. But in order to have the daily requirement of that Vitamin [750microgram], one would have to consume 3kgs of golden rice. She stated that there are better women-centered options, such as coriander and curry leaves, which have 1300 micrograms of Vitamin A; 70 times more efficient. Golden rice is also hazardous because of genetic manipulation, antibiotic markers and a carcinogen as a vector, which is escaping from the plant and entering the open environment. These corporate inefficient technologies are causing new diseases. Dr Atiq stated that at the moment, there is enough food in the world to feed everyone. He clarified the point by saying that Food Growth, food yield, is what happens in the agricultural sector; Food Availability is how much food is in the silos; Food Security is how much food is available on an individual’s plate. There is a huge gap there, which points to the mismanagement of food. He said that the fundamental issue with Green Economy is sustainable development that is environmentally sound and socially just. He criticized the fact that we have put in place a system that is flawed. It is not the farmers or the women at the political showdowns. Yet in the local and global scenarios, the politicians are allowed to bring up agenda that does not fit a developing country. He mentions how Bangladesh has become better able to fight against cyclones, in that, the damage and impact of the cyclone are still vast, but mortality has been brought down due to various factors such as governments, NGOs and the local people working together and the quick mobilization of resources. “We’re not helpless. There are things we can do. But as Vandana rightly said, it has to be done by the community, preferably by the women, because they know and understand the need of the family better. have to provide every citizen with food security, energy security, water security, livelihood security and health security.” He emphasized that we have to think in the right perspective and not hand everything over for profit. Ms. Khushi Kabir, coordinator of Nijera Kori, spoke next on the issue. She said that it is the woman’s role that is crucial at the micro-level and the current systems, specifically political economy, are taking their contributions away. In Bangladesh, there is a great disparity and this affects especially the rural women who work from home living below the poverty level, and who have to fend for themselves for the sake of their families. When their issues are raised, the people speaking up for them are labeled as anti-development. She paints a picture of the ship breaking industry, which is destroying the coastal ecology for the benefit of a few people. She speaks of the issue of deforestation and then reforestation with rubber plants, which are harmful to the environment. These rubber plantations have often taken place in the lands of the indigenous people, taking away their symbiotic relationship with their surroundings. The rise of the tobacco industry has destroyed large tracts of agricultural land. Tobacco cultivation is negative on two fronts: a) it is taking away the nutrients from the soil without giving anything back and, b) women and children work in the smoking houses where tobacco leaves are cured and they face grave health risks. She says that since the wetlands are being taken over by real estate companies, a clear demarcation of the land and the river is necessary. She speaks of Jholok dhan from China, which has caused problems. in the south of Bangladesh. She speaks out against contract farming, because the farmers are no longer in control of the seeds, no longer in control of the market, they are no longer in control of what they are producing. And women’s control over seed cultivation, what is to be produced, such as vegetables and greens, is no longer there. It has bowed to commercial ventures. The pollution of our rivers has continued unchecked. The shrimp cultivation, hailed as a great export opportunity, is a ruse. Cultivated industrial shrimp for export is less than 1%. Ms. Kabir was of the opinion that a few companies controlling most of these operations go against the democratic system. 16 condition of this region. 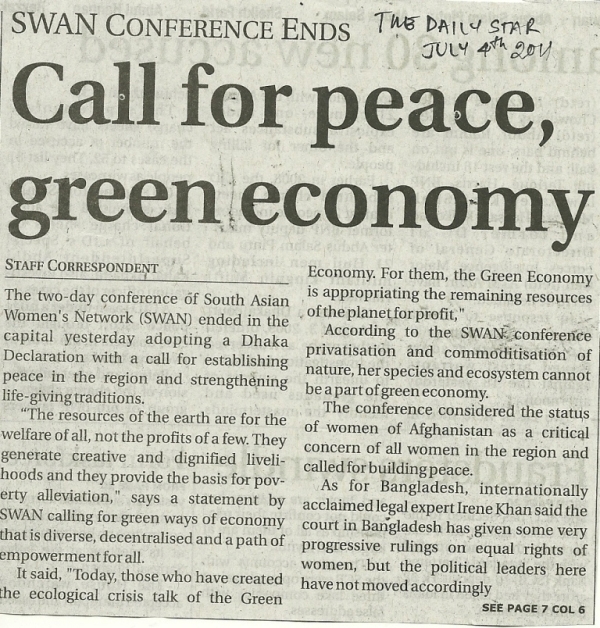 The members of SWAN collectively commit themselves to working together to show that a better world is possible for South Asia through regional cooperation. 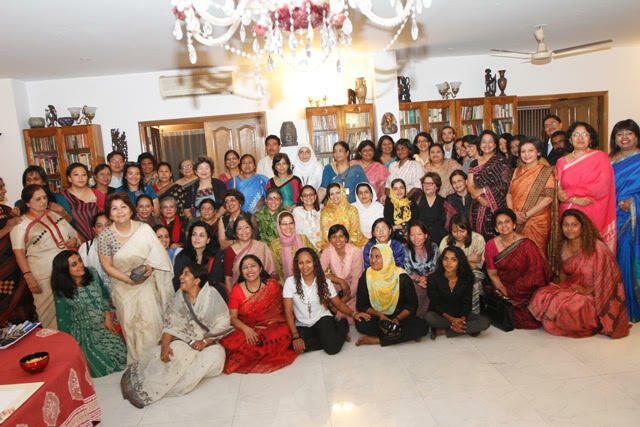 The South Asia Women’s Network (SWAN) stands committed to forging ahead on sustained regional cooperation through each of the eight individual SWANs. 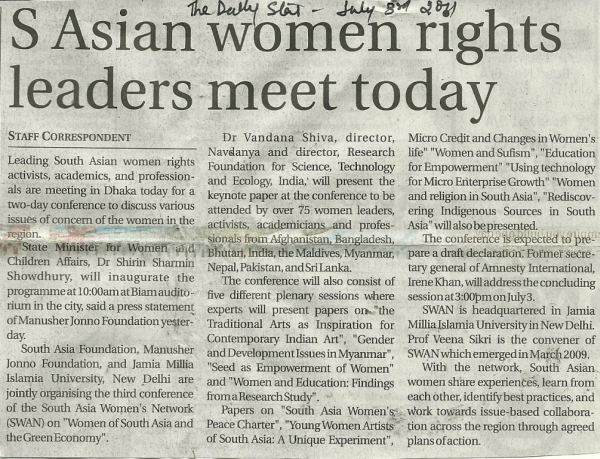 The Dhaka Declaration emphasizes SWAN’s commitment to making the voices of the women of South Asia heard at all important regional and multilateral forums where these issues are being discussed The conference ended with the valedictory speech by Ms. Irene Khan, former Secretary General of Amnesty International. In her valedictory speech she said that the work that SWAN was doing was incredibly important and that the network they had built by crossing boundaries and breaking barriers was the methodology for peace. Women’s perspective could change dynamics in the field of human rights was what Ms. Khan felt. She talked at length about women’s rights being synonymous to human rights. She said that the feminist definition of human rights, for her, would be to have economic, social and cultural rights along with civil and political rights. Talking about South Asia she said that this was a wonderful region of deep contradiction where four of the nine countries have had women heads of government, a higher average than any the region in the world. She analyzed that along with commendable economic growth over the last two decades, in this region, had come great inequality and marginalization. According to a UN report, published last year, South Asia was the second worst in terms. of gender equality ratio and that half of the women in South Asia were illiterate with a life expectancy five years shorter than their male counterparts. South Asian women had a high mortality rate and high rate of school drop-out. Ms. Khan felt that no country in the world would even dream of putting the kind of discrimination on the basis of race that they put on the basis of gender. Speaking about Bangladesh, she said that there are some very good laws for the equality of women, but few of them are being properly enforced on the ground, in many situations due to flaws in the system. She spoke against eve-teasing, saying it is a word designed to hide the true nature of the crime, which is sexual and gender harassment. She praised the progress in terms. of stands against the fatwa, but blamed the politicians, political leaders and religious leaders for being silent and not moving the country forward. She stated that women are still a population without a voice, forced to comply with the decisions made by someone else, even in their own households. She mentions the issue of abortions and sexual reproductive rights which cause a lot of dissention even in Europe and said that discrimination against women is not restricted to select parts of the world. This lack of voice is further emphasized by the fact that only 30% of women, who borrow money from banks, are directly involved with the spending of it and payment of interests. The rest borrow mostly for their husbands and have no control over the money. She suggested that these issues have to be taken head on by organizing proper networks for women including political, local and social domestic networks. And that the governments have to be pushed until they take action. She ended by saying that the world has made progress; the current generation of women is far ahead of the previous generations and the future generations will travel further still. But this change comes from the women’s collective effort and this is why SWAN is so vital. The conference was concluded by a few final words of good-bye by the Convener. 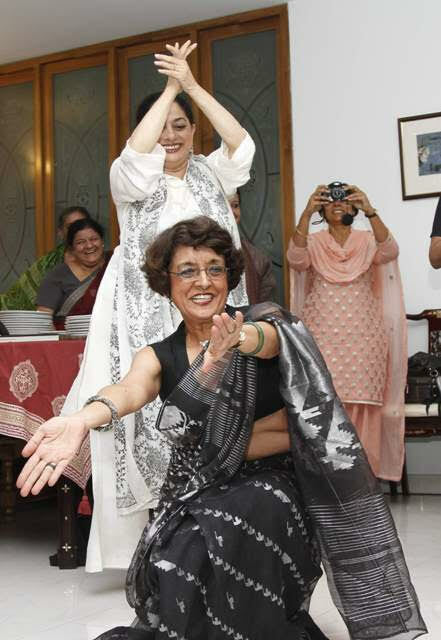 Professor Veena Sikri thanked Ms Pramila Rijal, Chairperson of SCWEC, for her graciousness in agreeing to co-host the Fourth Annual Conference of SWAN in Kathmandu, Nepal in 2012. 7. Ms. Hasina Safi, Afghan Women’s Education Centre (AWEC), Kabul. 12. Ms. Tropa Majumdar, Theatre Director, Dhaka. 13. Ms. Munni Saha, Head of News, ATN News, Dhaka. 26. Ms. Roseleen Gurung, Microfinance Specialist, Tarayana Foundation, Thimphu. 57. Ms. Madeeha Gauhar, Artistic Director, Ajoka Theatre, Lahore. 63. Dr Faiz H Shah, Head, Development Management, Asian Institute of Technology, Bangkok. 65. Ms. Zehra Arshad, National Coordinator, Pakistan Coalition for Education, Islamabad. 68. Ms. Vidyani Hettigoda, Chairperson, Women’s Chamber of Industry and Commerce, Colombo. 72. Ms. Chandramali Liyanage, National Crafts Council of Sri Lanka, Colombo.